A new play gutsy enough to be generous. 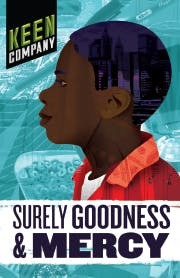 Set in an under-funded public school in Newark, Surely Goodness and Mercy by rising playwright Chisa Hutchinson, tells the story of a bible-toting boy with a photographic memory who befriends the cantankerous old lunch lady. Against all odds, Tino and Bernadette help each other through the mess of growing up and growing old. Surely Goodness and Mercy has spent the last year charming audiences across the country. Now, Keen is honored to bring this vibrant new play to New York for the first time.